Are you a new Soil Building Program customer? Or perhaps you just transitioned over to using organic products yourself in your landscape. If so, you might be wondering how long it will take for your new organic program “to work”. One of the biggest concerns our new clients express is how long they will have to wait before they see results. The short answer? Probably longer than you thought. But patience pays off with organics. Lawns that have been maintained using conventional chemical maintenance programs have essentially been living in an artificially maintained environment. They are dependent on outside sources for all of their necessary nutrients. Soil in these landscapes often become hard and compacted, contributing to root suffocation and water runoff. The soil itself isn’t able to foster much bioactivity so it has a hard time offering support to your lawn. How do chemical treatments hurt? Chemical treatments weaken your soil and deplete it of nutrients. Just adding more chemicals to “feed” your plants will be a waste of money and time if your soil isn’t being fed properly as well. Over time, chemical treatments kill off the microbes that help plants uptake nutrients in the soil through their roots. Your plants became dependent on the additional synthetic fertilizers instead of relying on the nutrients that should be available directly from the soil. Sure, high-nitrogen chemical fertilizers do give a quick boost to your plants, and can green them up quickly. And while using a high-nitrogen fertilizer might be necessary once in a while to help cure a significant nutrient deficiency, it’s the ongoing continual use that causes problems in your soil and the environment. 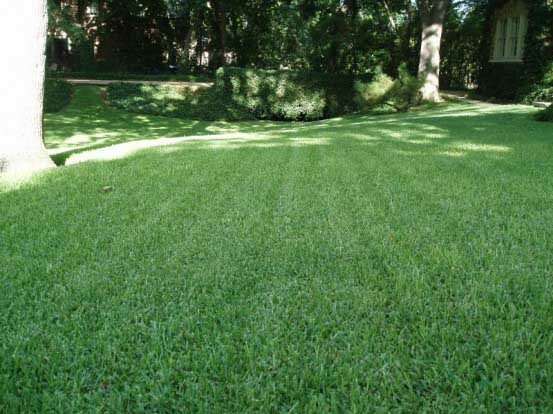 We understand that your goal is to have a lush, thick green lawn that everyone will see – as fast as possible. But a commitment to an organic lawn program, and healthy rich soil, will take some time and patience. When transitioning your lawn from synthetics to organics, you can’t expect overnight results. To see reasonable and meaningful results, one to three years is a realistic expectation of time. What will you notice as you continue on your soil health plan? The texture of your soil will become looser and darker. Earthworms will suddenly begin to work your soil. Plants will begin to look healthier, even when you forget to fertilize. Your soil is less compacted. The soil has better drainage. The Soil Food Web will begin to work and your soil will fill with microbial activity that is helping your plants to uptake nutrients more efficiently, growing them stronger and healthier. Your lawn will develop a deeper stronger root system. Your lawn won’t be damaged as quickly by periods of drought, or be as susceptible to pests and disease infestations. If you have questions about your organic maintenance plan and what to expect, please don’t hesitate to call.